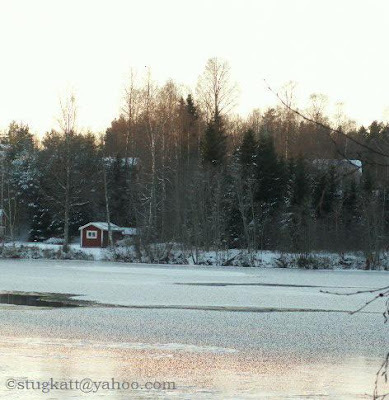 Yesterday was sunny — and cold, -20°C (-4°F) — the river looked like a painting by the Swedish painter Gustav Fjaestad*. Today it is not quite as cold, cloudy and back to the gray nuance we are too familiar with by now. I finally got the car back late Thursday afternoon, so I could go shopping the next morning. It's great to have fresh fruit and vegetables again. Considering that this was how most people lived before freezers and and supermarkets there is no reason to complain though. But I think I'll get one of my favorite poems out, John Greenleaf Whittier's "Snowbound". Gustav Fjaestad (1868-1948), made the frost- covered fields and snow-laden branches of the Swedish winter his hallmark. He too adopted country life, migrating to the densely forested province of Varmland in western Sweden, where he and his wife became the centre of a group of artists and craftsmen. But he was less interested in depicting country activities or wildlife than in exploiting the abstract pictorial qualities of the landscape. In his hands, the countryside in its winter guise became a vehicle for decorative surface patterns of dots and swirling Art Nouveau inspired arabesques. Yet they are never blandly pretty, and occasionally contain a hint of menace. The cold, unknown depths of the mysterious stretch of water contained within snowy river banks in Winter Evening by a River carry a sense of foreboding.